Finally At Home In The Modern World. I’m going on my fifth year of Dwell Magazine subscriptions. I love architecture, especially mid-century modern, very geometric design. Over the past years, I’ve read about urban renewal, prefab projects, loft living, and off-the-grid green. Yet I’ve always thirsted for articles more suited for the common family, because let’s face it, sometimes you just want a big backyard, some babysitter-age neighbors, and a cul-de-sac for impromptu kickball tourneys. After four plus years of constantly lusting over a myriad of modern marvels—Dwell finally released the issue for the rest of us. 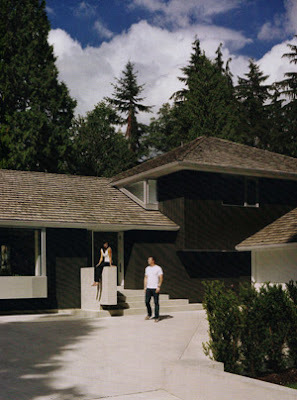 Their latest installment celebrates suburbia and even showcases a modern reinterpretation of a totally typical tri-level (just like what we have). This issue exposes the classic subdivision as a critical solution to a unique time in North American history. And despite extraneous things like inoperable shutters and excessive vinyl siding—these homes typically have bones worth preserving. The theory they put forth, with which I completely agree, is that living in and redesigning these homes is a form of sustainability. Granted a vast majority of the featured renovations cost bucks deluxe—but I can honestly say that I was totally inspired by this particular article. I most likely felt this way because for the first time a Dwell-featured redesign actually seemed attainable. The previous issue did have an article showcasing a modified, blue Cape Cod—the very color and style of my childhood home. And that was inspiring as well; there just ain’t too many Capes out here on the West Side. Simply put, there is power in good design. And good design can be applied to nearly any image, object, or dwelling—no matter how mundane it may seem or how humble its beginnings. 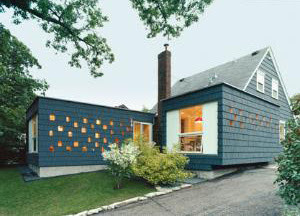 Good design can give spirit to sprawl and turn 'burbs into Bauhaus. Red Porsche Is My Maroon Golf. On May 14, 1998, the nation united to watch the much anticipated series finale of the show about nothing, Seinfeld. About 4 minutes into the finale, I knew that for me the real series final had actually aired one week earlier, on May 7th. In my opinion “The Puerto Rican Day” was the last genuine Seinfeld episode and the true series finale. This episode featured each of the characters at their finest—even Kal Varnsen, H.E. Pennypacker, and Art Vandelay made appearances. This episode also introduced one final nemesis to Jerry and his Black Saab: Maroon Golf. This episode introduced a new concept to me, the combining of driver and vehicle to become a single entity. Maroon Golf was the combination character of a vehicle (a maroon VW Golf) and a driver (in this case, comedian Mario Joyner). From that point on, I’ve designated my share of freeway foes in a similar fashion. And for the past couple of weeks the same dude has pestered me nearly every day: Red Porsche. First let me say that his vanity plate is the biggest oxymoron ever: UNDRADR. Pa-leeze Red Porsche! Seriously, you couldn’t be more over radar here in good old West Jordie. Other than the inaccurate license plate, Red Porsche is actually a fairly competent archrival. I mean, the guy’s a decent driver, he understands the rules of engagement for a quality game of cat and mouse, and our cars are fairly comparable performance-wise. 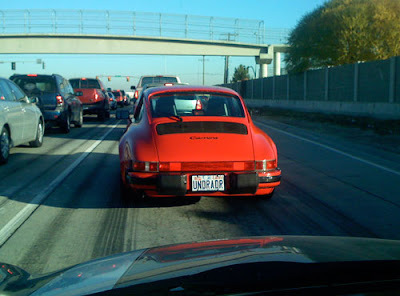 So on Thursday last week, I once again encountered Red Porsche on the way into work. I made sure I was right behind him as we merged on to the freeway. As soon as he was on the open road, he took off. Now there’s no way for a 2006 Cooper S to catch even a 1989 Carrera in a 0 to 60 scenario, or in this case a 45 to 85 scenario. But I’m patient, highly maneuverable, and I know that to succeed in a freeway game of cat and mouse—you’ve got to think of it like chess. You play 3 moves ahead. Basically, I just drove pretty normal, using stratagem with each lane change. We exchanged leads a couple times. I knew all I needed to do was be about a car length away before “the curves”. Meanwhile, Red Porsche, made some clumsy moves and ended up behind a delivery truck putting him in perfect position for an old fashion smack down. As we drew nearer to the curves, I was right on his tail. I could tell he was accelerating just a bit too much into the first curve. I on the other hand did the usual: geared down to 5th and let off the gas, then as I entered the turn, and geared down to 4th. We were both in the outside lane. Then right at the sweet spot, I gunned it, changed to the inside lane, and sling-shotted right past him. Booyah. Oh Red Porsche, when will you learn? On a side note, Best Buy mislabeled the newly released DVD of Seinfeld’s 9th and final season today. It was supposed to be $29.99 and it was marked as $16.99. I actually brought it to their attention, but the pimple-faced “manager” shrugged and just asked me if I wanted it or not. Booyah. Maybe The Trekkies Have A Chance. So every fall, Mrs. Kyality makes a list of all the new shows that we’re supposed to check out. We typically sit thru the first few minutes of several different premiers and I admittedly get my kicks out of sniping the crappy ones with the flick of the remote. This season, there’s been one standout that hasn’t received a swift execution, ABC’s new show: Pushing Daisies. This show’s the brainchild of former Star Trek writer Bryan Fuller. In the heyday of DS9 and Voyager, Paramount had an open script submission policy. Fuller submitted a script, got it produced and eventually worked his way up to co-producer status on Voyager. Since then Fuller has been best known as the co-executive producer of a show I totally don’t watch: Heroes. But this season he left NBC and Heroes to start his very own series. Pushing Daisies is a fun, surreal combination of Amelie and Big Fish, with a hint of The Royal Tenenbaums. It tells the story of Ned (Lee Pace) a dead-reviving pie maker who accidentally revives his childhood girlfriend, Charlotte 'Chuck' Charles (Anna Friel, pictured above). The writing is witty and multilayered. The acting is strong and silly in a good way. And the special effects are very tongue-in-cheek and dreamlike. But the best part of the show is Chuck. She’s the uber-positive, walking-dead with a serious Jenny Lewis thing goin' on. We’ve been watching beautiful, hi-res episodes on ABC.com’s killer Full Episode Player. And after each one, you can’t help but smile and you definitely thirst for next week's. Pushing Daisies airs on Wednesday nights, but the eps are online and ready to stream the very next day. Bottom line, if anything good ever did come out of the late 90’s Star Trek franchise, it’s this.